A Score To Settle is the one-woman musical cabaret performance starring the vivacious and extroverted Rita Costanzi and her grand harp. This former principal harpist of the Vancouver Symphony and CBC Radio Orchestra did not disappoint her opening night audience. The musical monologue loosely followed Rita’s life, from her glorious and grandiose birth under a pregnant moon, to finding a partner crazy enough to love another harpist, her experiences with a tea-reading fortune teller and an exploration of why she has dedicated her life to this instrument that has essentially become an extension of herself. The narrative was very neatly scripted and clearly well-rehearsed, but having been expecting a more casual cabaret-style narrative it took me a few minutes to ease in to the dialogue and readjust my expectations of the evening. 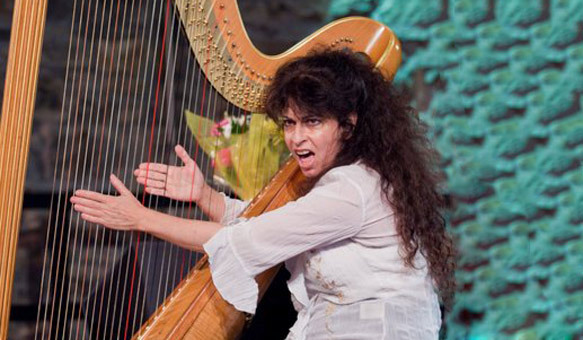 With music weaved between her bubbly narrative, Costanzi was easily one of the most incredible harp players I have ever been privileged to see. And being in such an intimate venue such as The Butterfly Club the experience was even more unique- when else do most people get to sit within meters of a beautiful unamplified harp and hear it played so exquisitely? The audience was consistently blanketed in silence as soon as her fingers hit the strings. I myself was constantly mesmerized by her pieces, but my favourite piece for the night was a beautiful rendition of the Celtic classic, “Danny Boy” – clichéd, I know, but lacking a strong classical background and any type of program I found it hard to identify many of the compositions by name. A little informational playbill-style sheet may not go to waste in future performances. I particularly loved the small excerpts where she sang into her harp whilst playing. The ethereal and mesmerising result sounded like was an ancient Elvish song taken from straight from Middle Earth, and made me wish she had done more singing and playing, although I can imagine this would be incredibly difficult. A Score to Settle is an extremely unique and entertaining 70-minute piece of musical art that Melbourne audiences are lucky to experience for another couple of days. The fact that Rita and her harp made it to Australia in one piece is a major effort in itself that deserves rewarding if nothing else. A Score to Settle will be performed for the next three days at the iconic Butterfly Club in Carson Place, CBD.